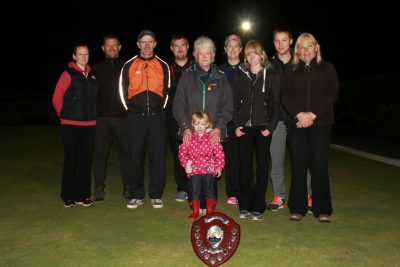 Local Mary Alderson (Marown) and Yorkshire man Gaz Lally (Crossgates) were on top of the world last week after winning their respective bowls festival finals. 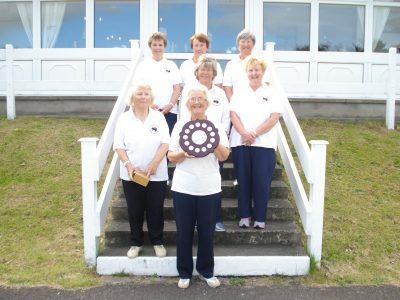 Mary Alderson deserves every accolade afforded her after a finals day performance that would rival any previous local success in the ladies main competition. She was simply tremendous. Mary was without quesiton the best player on finals day and sealed victory with a final win over Veronica Lyon (Beechams Unison). In the final Alderson started quickly moving into a 14-7 lead before Lyon found her form to narrow the gap to just one point at 13-14 It was the closest anyone had got to Mary all day; however she handled the pressure magnificently and maintained her composure to rediscover her length and move 18-13 ahead. Lyon dug deep but didn’t have enough to catch the magnificent Manxie as she took the title 21-16. In the semi finals Mary fought off defending champion Lynsey Gorman (New Brighton) 21-15 whilst Lyon ended the challenge of Port St Mary’s Margaret Tasker 21-9. Tasker should be very pleased of her efforts falling just one game short of a final appearance. Win Collister (Port St Mary) should also be very happy with her weeks work as she made it to the quarter finals before falling to Lyon 21-13. It’s hard to put into words how special this moment is for Mary who has now found success in our premier competition after twenty five years of trying, and she fully deserves every second of her time in the sun as a very worthy Champion. There was a contrasting story in the Men’s competition with Gaz Lally winning his first ever senior Men’s Final to win one of the most coveted prizes in the sport. Lally was on it form from the off on Friday’s finals day and despite being the outsider with the bookies in every game he played, he overcame the odds to seal a fantastic victory beating former champion Martin Gilpin (Kendal) 21-17 in a brilliant final. It was nip and tuck for most of the match with neither player able to gain the upper hand and Gilpin actually led the match at 17-16. Lally who had shown the composure of a true champion throughout the day dug deep and found his best when he needed it running out 21-17 and taking with it the title and the £3,000 prize money. All I can say Gaz is it’s not a bad first open to win! If the final was brilliant Lally’s semi final with Wayne ‘The Beast’ Ditchfield (Kirkham Cons) was simply spectacular. Lying game down at 20-20 Lally produced questionably the bowl of the tournament to take the win under immeasurable pressure and book his final birth. Colin Kelly (Marown) was the furthest Manx Man in the competition making it to the quarter finals where he was beaten by Lally’s stable mate Kez Smith (Crossgates). Smith missed out on making it a derby in the final going down 21-14 to Gilpin in the semis. The tourism competitions saw two locals just missing out with David Bradford (Onchan) falling 21-15 to Johnathan Guess (Burbage) at the final hurdle and Janet Monk (MooraghPark) doing the same 21-13 to Tracy Ryan. It is an exceptional achievement to make it to the final of a competition with the same stellar line up’s of the main event, and despite both being disappointed not to win they should be exceptionally proud of their efforts. There was another hard luck story for a local in the Men’s consolation competition with Matthew Keggen (Onchan) narrowly losing out to Dave Jackson (Railway) 21-19 despite lying game at the final end. It was an all visitors affair in the ladies consolation with Joyce Jones (SkyeBC) defeating Violet Dennison (Levens) 21-11 in the final. There was a familiar feel to the final of the last chance mixed competition with Michael Coupe (Houghton) just getting the better of another local, Sid Bolton (South Ramsey), 21-19. In the final singles competition of the week, the Visit IOM.com flyer, Roger Morgan (Knutsford) tasted success with a 9-6 win over Darrell Wilbur (Nursery). The doubles proved almost as popular as the singles competitions and since its inclusion the open doubles has become one of the most sought after titles of the week. The standard of play in the final was exceptional with visitors Wayne Ditchfield & Barry Booth just having enough to see of the challenge from South Ramsey’s John Kennish and Dave ‘Dido’ Kelly 11-9. The men’s doubles yielded some local success with Onchan’s Matthew Quirk teaming up with Merseyside’s Michael Davies to defeat Callum Wraight (Castlefields) and Stuart Garret (Douglas) 11-9. In the ladies doubles finals Lynsey Gorman & Kathleen Watkinson (Tarleton) were victorious beating Paula Garrett (Douglas) & Maureen Lyons (Mossley Hill BC) 11-4. There was local success in the mixed doubles with Rita Callister (Port St Mary) teaming up with Andy Mailer (Meersbrook) to take the title with a 9-0 win over Matt Simpson (Kendal) & Nicola Gilmore (Wirral). In the end of a brilliant week of bowling MLC David Cretney presented the prizes on behalf of the Department of Economic Development to the worthy winners. 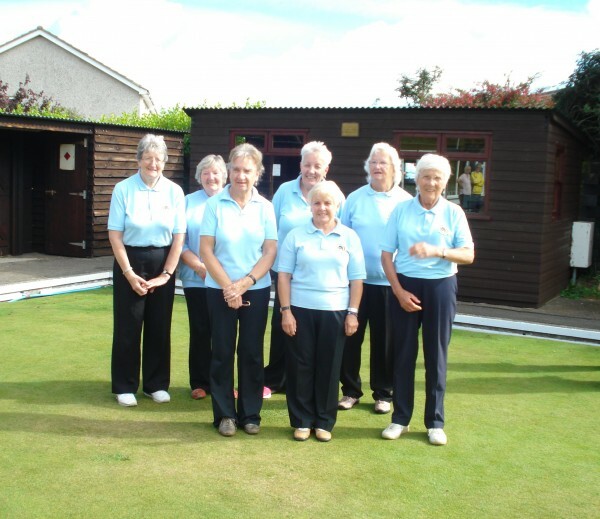 Praise must once again go to Steve Moore and his hardworking team of co-ordinators who once again ensured the smooth running of yet another Isle of Man Bowls Festival. This year they even managed to book the weather! Thanks also need to go to the Department of Economic Development and Manx Telecom for their continued support and sponsorship of the flagship of the British bowling season. Final thanks must go to the green keepers who once against produced unparalleled playing surfaces which were the envy of the visiting bowlers. The final word however belongs to Mary Alderson who flew the Manx flag with honours it probably hasn’t all sunk in yet for her, but hopefully reading about her success in black and white will make it seem more real! You did it Mary. Visitor Darrell Wilbur will have been delighted with his victory in the Steam Packet sponsored Thurwell Competition at Nobles, as his 21-19 final victory over Janet Monk saw him sail away with a voucher for a car and 2 passengers. In a close match Wilbur just had enough to get over the line against a spirited Monk. In the semi finals Wilbur eliminated Joyce Ogden 21-17 whilst Monk put out Stefan Kelly 21-11 at the same stage. Fallers at the quarter final stage were Glynn Hargraves, Derek Allen, Margaret Tasker and Bod Boland. Thanks go to NoblesPark for running the competition and the Steam Packet for their much appreciated sponsorship. 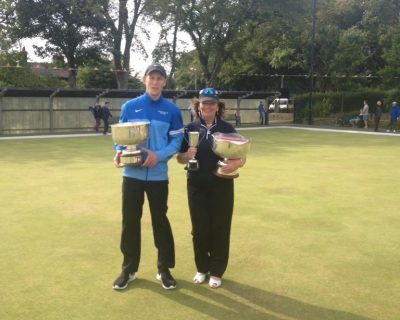 Neil Withers & Hannah Drewitt won the final event of the Festival Weekend with victory in the Wilfred Quayle Mixed Doubles at Castletown Bowling Club on Sunday. They didn’t have things their own way though and tasted victory by the narrowest of margins as they beat Trevor Quayle & Lyn Bolton 21-20 in a fantastic final. In the semi finals our victors beat Alan Moore & Hilary Kermode 21-10 whilst our runners up knocked out Derek Lewney & Heike Perry 21-12. Fallers at the quarter finals stage were Jenny Moore & James Tears, Joy Stephens & Dave Quayle, Joyce Ogden & Mike Hargraves and Chris Price & Dido Kelly. Thanks must go to Castletown for a tremendously well presented playing surface and the smooth running of the competition. It would be great to see some support both for the teams who reach the final and all spectators are welcome. There will be tea, coffee and biscuits provided.